On this 2014 edition, harbour developments are shown at Dársena Pesquera (Marina Tenerife) and Puerto de las Palmas, the Morre Jable sketch plan has been replaced with a fully WGS84-compatible plan, and three new plans have been introduced. 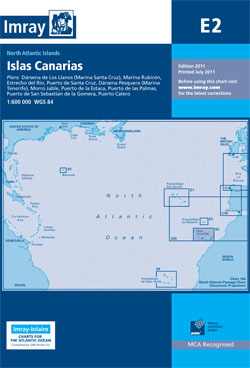 On the front of the chart, a plan of Puerto de Naos and Los Marmoles has been introduced to show the new Marina Lanzarote. On the chart reverse are plans of Tazacorte (I. de la Palma) and Gran Trajal (Fuerteventura). Iolaire-Charts are a series of Imray Charts for the Caribbean and Atlantic Ocean. Many of the charts in the series now include sailing directions on the reverse side. Designed under the guidance of D.M. Street Jr. who has 50 years of unrivalled first-hand knowledge of the area.